A couple of lonely bananas languishing on a kitchen shelf. A bar of Swiss white chocolate. A jar of milk-chocolate pecan sauce made in Louisiana. A pie baked as a thank-you gift. From these seemingly inauspicious beginnings have come some of the most memorable desserts served in metro Detroit restaurants. The bananas were in the kitchen of Ferndale’s Assaggi Mediterranean Bistro a few years ago, when one of the chefs decided to create a dish with them. The chocolate bar inspired Rattlesnake restaurateur Jimmy Schmidt to create White Chocolate Ravioli. And the jar of chocolate sauce spawned the Gold Brick Sundae, which has been served since the early 1950s at the Caucus Club — and before that, at the old London Chop House in downtown Detroit. And since Melinda Montgomery baked that first Key lime pie for Tom Brandel, Tom’s Oyster Bar restaurants have become almost as famous for the pie as they are for the titular mollusks. These are all among 10 signature desserts that local restaurateurs say will never be taken off their menus. Here’s a tantalizing tour of seductive final courses. 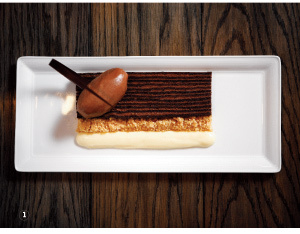 Wolfgang Puck’s restaurants salute his roots with this 12-layer confection that’s patterned after one of Vienna’s most famous pastry creations. It features 12 layers of flourless chocolate cake soaked in mocha syrup and layered with praline chocolate mousse. And, as if that weren’t enough, it’s served with crème anglaise, a dab of finely ground caramel sugar and hazelnuts, and chocolate sorbet at the Wolfgang Puck Grille. Inside the MGM Grand Detroit, 1771 Third, Detroit; 313-465-1648. Melinda Montgomery learned how to make the classic pastry as a teenager in Florida. The golden pie is topped with whipped cream and a slice of lime on a graham-cracker crust. It has been served since the mid-80s at Tom’s Oyster Bar — first at 15402 Mack Ave. in Grosse Pointe Park (now Dylan’s Raw Bar and Grill — which also has the sweet, silky confection) — and at all Tom’s locations. 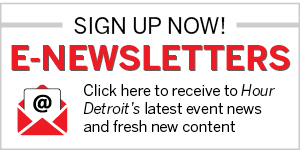 Downtown Detroit, Royal Oak, Rochester Hills, St. Clair Shores; tomsoysterbar.com. It’s wrapped in phyllo dough along with honey, sugar, clarified butter, and pistachios, baked, then served with housemade vanilla ice cream and more crushed pistachios, a drizzle of raspberry sauce, and crème anglaise. It’s a favorite finale at Assaggi Mediterranean Bistro. 330 W. Nine Mile Rd., Ferndale; 248-584-3499. Elmer’s Gold Brick chocolate-and-pecan sauce sticks to the two scoops of vanilla-bean ice cream, transforming the sweet concoction into the ultimate ice-cream bar. It’s served with a gaufrette cookie at The Caucus Club. 150 W. Congress, Detroit; 313-965-4970. Swiss white chocolate is run through a chilled ravioli mold. Then each little “pasta” is filled with chocolate mousse and served with hazelnut sauce and a sprig of mint. It’s a mainstay at the Rattlesnake Club. 300 River Place, Detroit; 313-567-4400. This rich, flourless, dark-chocolate cake is made to order in individual ceramic ramekins and under-baked so that the center flows like lava. It’s served with house peppermint-stick ice cream at The Hill. 123 Kercheval, Grosse Pointe Farms; 313-886-8101. The lemon liqueur that originated on the Amalfi coast scents this dessert, which alternates layers of crisp pastry dough and Genoise cake batter with a light Limoncello cream. An appropriate finish to a classic Italian meal, it’s garnished with mint grown on the grounds at Ristorante Café Cortina. 30715 W. 10 Mile Rd., Farmington Hills; 248-474-3033. Fresh raspberries, vanilla-bean ice cream, and whipped cream dress up the layers of puff pastry and apples sparked with cinnamon. It’s a perennial favorite at downtown’s Opus One. 565 E. Larned, Detroit; 313-961-7766. This is the perfect dessert for the operatically grand mansion on Woodward. It consists of layers of almond sponge cake with coffee buttercream and dark-chocolate ganache with a dark-chocolate mirror glaze. The Whitney presents it with a drizzle of chocolate script that spells o-p-e-r-a atop the coffee-buttercream icing. 4421 Woodward, Detroit; 313-832-5700. Pastry chef Michael Laiskonis created this confection while he was at Tribute. And though he has since moved on to Le Bernardin in Manhattan, it’s still served here, where it’s now in the hands of pastry chef Greg Stroker. Chocolate pot de crème is baked into the lower third of a brown, organic eggshell. That’s followed by liquid caramel, then caramel foam, a drizzle of Michigan maple syrup, and a pinch of sea salt. Nothing else garnishes the plate. The Egg stands on its own at Tribute. 31425 W. 12 Mile Rd., Farmington Hills.